MetaNow gives you the possibility to quickly inspect a Movie or TV Show you are watching right now without leaving your currently active Application. MetaNow runs in background as an Agent, you can find it in the Menubar near the Clock at the top right of ypur Screen, click on it to either access the Settings or to quit! Amazon xRay Feature gives you instant overview of who is starring right now on the Scene, just the Cast and only if available. Well, MetaNow doesn’t do that, MetaNow has no way to figure out the current acting Persons in a particular Scene, because this means, MetaNow would have to track a whole Movie with a timeline like Subtitles do to display a particular Information in a particular moment. What’s the Movie or TV Show about? 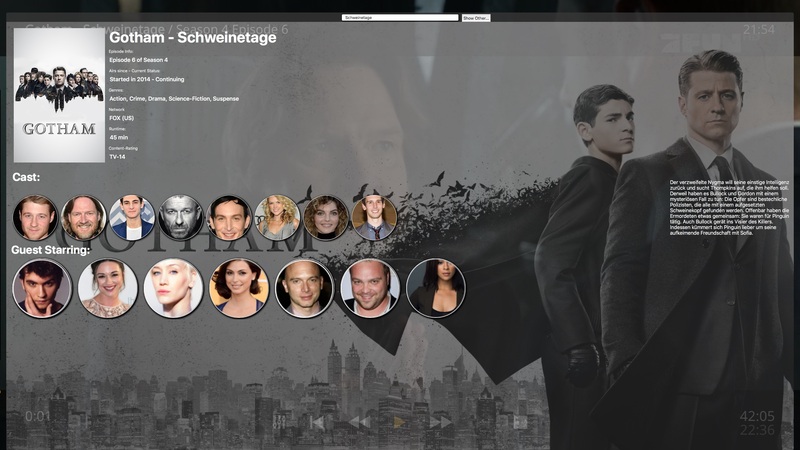 And about the Cast: MetaNow will give you the whole Cast as far as published with deep links, so you can click an /Actor or Actress to see various Informations about them and see what Movies or TV Shows they acted in as well. Everything it can do is right here without the need to leave or exit your Player/Movie, it’s right there where you you need it! MetaNow will become available only in fullscreen Modes, so a windowed Player will not be able to start MetaNow, this is by design! MetaNow does not use any Magic to know what you are watching right now, it simply looks at the Title of a supported Player and uses this to make a first Match, Well, this works great in Plex while Plex provides various other helpful Informations for MetaNow to know which Movie you are watching right now, in other Players like VLC this is different. That’s why MetaNow has a search filed which can be used either to correct the current Result or to simply search for any Movie you want similar to PCB Desk’s own search , but in a MetaNow overview instead. this may be also required for iTunes itself, while iTunes does not provide any cross referencing Informations so we can only use the current Movie Title to lookup a Movie, this works well, until a Movie may have the same Title and differs only by it’s year, so that’s why MetaNow has a Search field! And in TV Shows like from Plex or Amazon Prime Video, you can click the "Other..." Button to switch between all the known Episodes for a TV Show's Season you are watching right now. 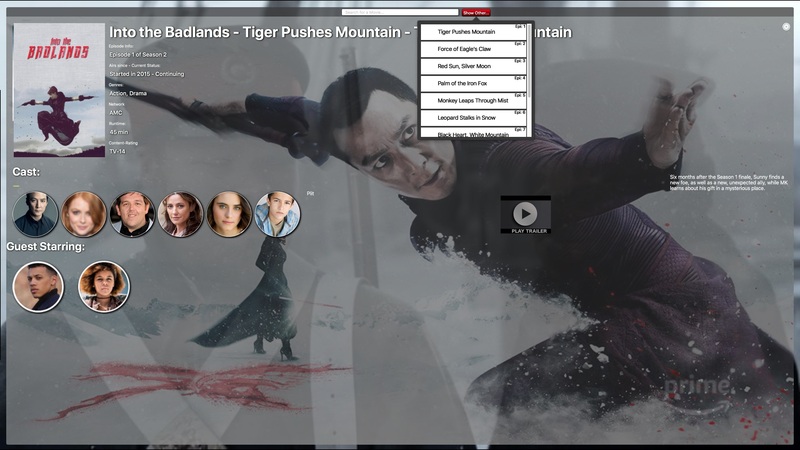 So if you have your Movie displayed and everything is ok, you see the whole Cast of the Movie as far as known by theMovieDBe.com, hover over any Person to see a floating bubble telling you his/her Name and their acting Role for easier detection. The recommend fast way: by using hot-corners like MacOS also provides, simply move your Mouse Cursor into a configured Corner of your Screen while in Fullscreen Mode and MetaNow starts its magic! All options are turned off by default and can be enabled from the Settings! Out of the Box, MetaNow supports only some Players, because MeteNow needs to obtain some basic Informations from these Players to know what to do and that’s why it relies on some knowledge about them. That’s why MetaNow is not an universal tool that displays anywhere on any occasion, you also don’t want MetaNow to appear in a Document you are working on, right? With VLC while in fullscreen Mode, MetaNow uses VLC’s title to check and search for the correct Movie, this should work well unless VLC uses any kind of Meta-Tags from its File itself, for common use, ensure the File you watch is named as the Movie! Any kind of Informations from PLEX starts with the PLEX Server Application that manages all your Database and due Security Reasons, this Data is protected and require any other 3rd Party Tool to be granted Access to its database, for this purpose, you MUST go to MetaNow Settings and and authorise MetaNow with PLEX by logging into your PLEX Account, that’s the only way to allow MetaNow to ask PLEX Server for your currently played Movie. More to come or if you have any specific Request for a certain Player, feel free to use the Support Form to ask for it! MetaNow was initially released as an Add-On for PCB Desk, but due to complexity and extensibility of MetaNow, this Add-On was excluded as a stand-alone Application, if you purchased PCB Desk because of MetaNow, feel free to drop me a Mail so you can get MetaNow for free.